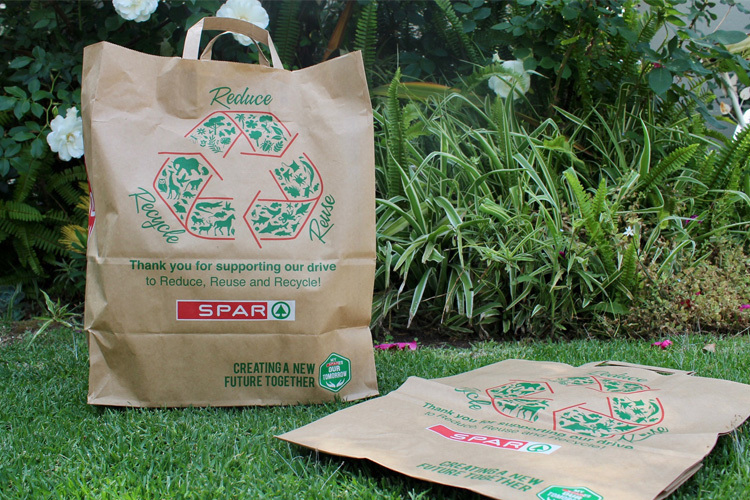 SPAR South Africa is revving up the fight against plastic waste by launching a new range of eco-friendly shopping bags as part of its #RethinkTheBag initiative. The new bag range includes a brown paper bag, a woven bag and a larger carrier called a taxi shopping bag. Changes have also been made to the plastic bags offered instore, with them now containing 8% calcium. It takes less energy to make these plastic bags, helping to reduce the company’s overall carbon footprint. “We want to encourage our shoppers to buy plastic-alternative bags, which are biodegradable, recyclable and reusable,” said South Rand Divisional Marketing Director, Martin Webber. According to Alison Zweers, Managing Director of SPAR Lowveld, the brand’s large presence in South Africa creates the perfect platform to raise awareness about plastic pollution: “We can make a meaningful difference in our communities. Education on plastic pollution is not enough. People need regular access to responsible alternatives if behaviours are to change,” she said. For now, the new shopping bags are being introduced to the South Rand, North Rand and Lowveld regions only. By choosing these eco-friendly bags, local shoppers will be contributing to the fight against plastic waste.